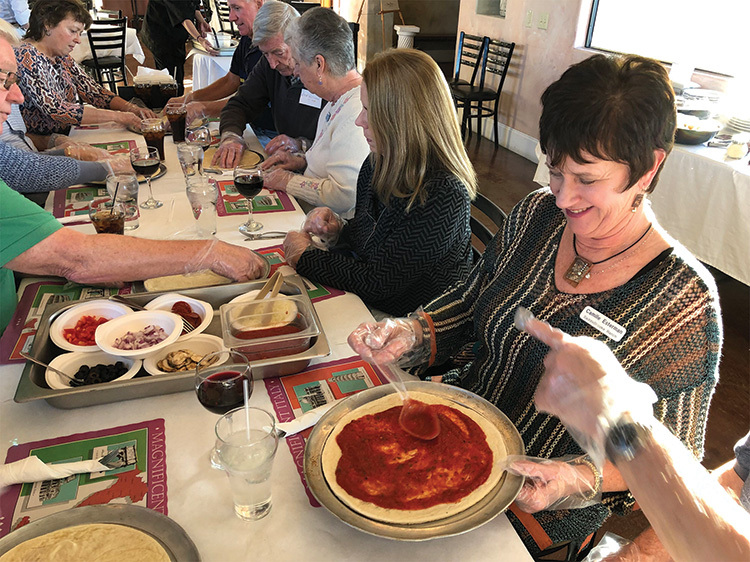 On a brisk Thursday evening, 34 Illinois Club members trekked to Nona Maria’s in Oracle to design their own custom pizzas! 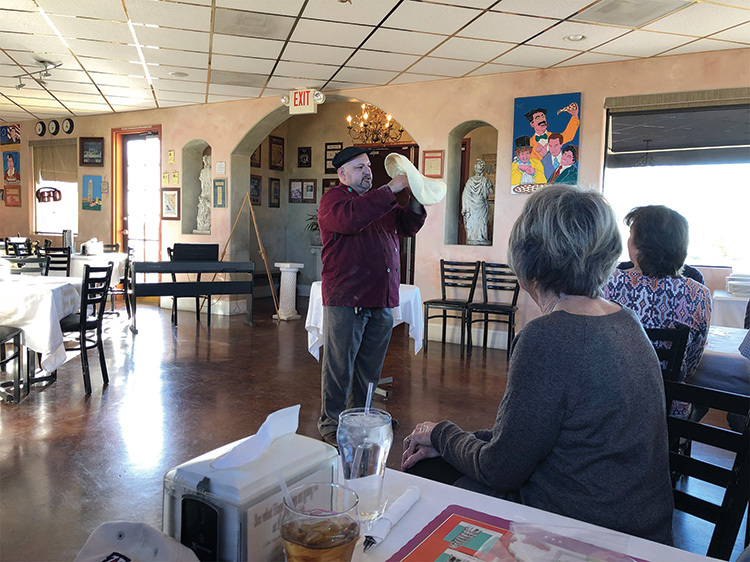 The owner, Frank Palazzolo, enlightened the group on how the pizza pie came to be; originally made for Queen Margherita of Italy. He reviewed his culinary education beginning in Sicily and ending in Oracle via Illinois. Nona Maria’s has been in Oracle for 22 years, beginning as a take-out only restaurant. Frank speaks both English and Italian, but without any accents. Frank went on to describe the difference between cooking pizza in a conventional oven versus a brick oven. He also shared some family secrets with us when creating our custom pizzas. 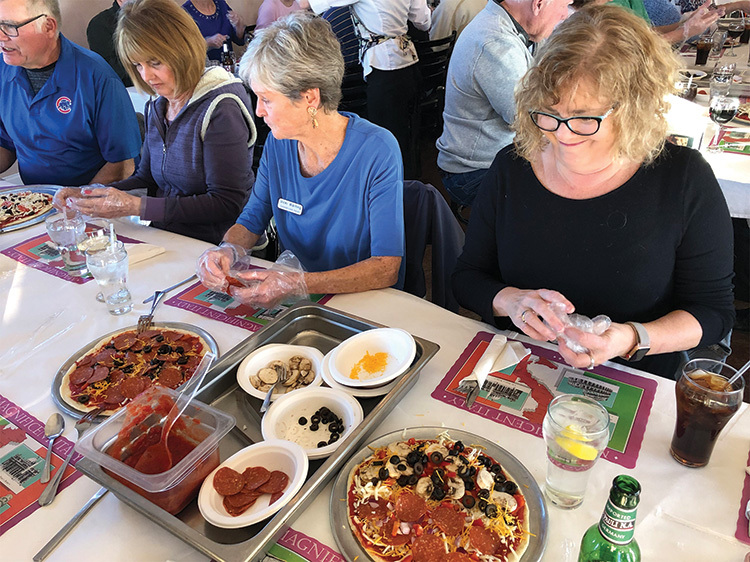 After watching Frank twirl his pizza crust in the air to thin the crust, each “twosome” was given their own pizza dough with assorted toppings. Some of the pairs were more creative with their toppings such as pepperoni and pineapple. Other twosomes prepared more traditional pizzas; however, there were a lot of half and half pizzas. While our pizzas were taken to the oven to bake, we were treated to a salad bar which included a few of Frank’s homemade pizza slices. Once baked, our custom creations were delivered back to us to savor our multiple flavors. The evening was topped off with various desserts, including homemade cannolis. It was a fun evening for all with many of us bringing home our custom pizzas to enjoy the next day. Nona Maria’s is owned by Frank and Angelina Palazzolo in the city of Oracle.